This specially developed technique helps you cope with mental and physical tension, strain and burdens. Everyone has a tolerance for stress, some greater than others. Stress can lead to dangerous hypertension (high blood pressure). Stop tension that causes headaches and drains your emotional energies. 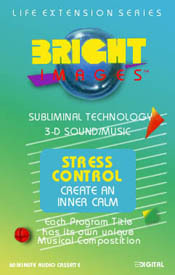 Get control of your life and put an end to stressful tension. Acquire a new inner calm that shows. This program is one of the most elaborate. It takes the physical body completely through a relaxation technique plus mental relaxation. It creates an inner peace and tranquility because it causes the release of tension. It is one that will be bring life long benefits and should be used whenever you feel the need.